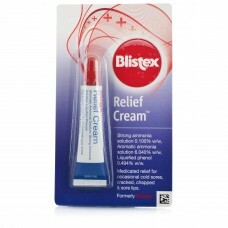 Blistex Relief Cream is medicated relief for damaged lips. Blistex Relief Cream is a penetrating and soothing remedy to relieve and treat occasional cold sores and cracked, chapped lips, leaving your lips feeling soft again. With healing properties. How to useBlistex Relief Cream: For cold sores: When symptoms arise, gently apply every hour to rapidly relieve any discomfort. You are more vulnerable to developing a cold sore if you are feeling stressed and rundown. Lipcare: Your lips are more sensitive during extreme weather conditions, so may need a little more care than normal. 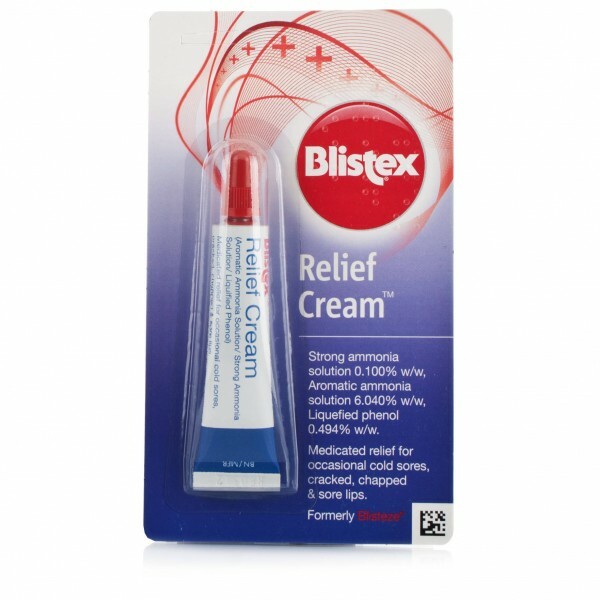 Apply Blistex Relief Cream frequently to quickly relieve sore, cracked and chapped lips. Blistex Relief Cream contains: Aromatic Ammonia Solution B.P 6.0%, Strong Ammonia Solution B.P 0.10%, Liquefied Phenol B.P 0.494%. Also contains: White Soft Paraffin, Modified Lanolin, Sorbitan Palmitate, Polysorbate 40, Peppermint Oil, Sodium Saccarin, Ethanol 96%, Racemic Camphor, Cineole, Purified Water.